In my early years in photography, the back (especially) pages of Popular Photography and Modern Photography were the sources of many of my lusts. That’s where the mail-order camera companies ran their ads. Some of those ads went on for pages and pages, in little tiny type, with small low-resolution images of the cameras stuck in every now and then. I’ve finally made a start on getting images of some of those old ads and putting them online. I use these to look up old prices, and to look up what gear was being advertised when, and to remind myself of some of the weird strange things that were being sold back then. I hope to keep adding data from additional years to this collection, and also to extract some prices into spreadsheets and charts to show how particular pieces of equipment or classes of equipment have fared over the years. Some day. Some of the images I have collected elsewhere and some I have made myself from old copies of the magazines, at the library or wherever I found them. Since I don’t own them, I can’t take them apart to get good clean flat scans of the pages. Sorry about that; I’d like better images myself, but I haven’t gotte my bound pages holding jig designed and built yet, so these were done freehand and are really rather rough. Olden Camera I remember for their signature bright yellow pages. They mixed new and used prices through their ads, and had a stranger collection of gear than most places. I remember I bought a used Leitz 90mm Summicron f/2 from them for my M3, and decided the condition just wasn’t go0d enough and returned it. 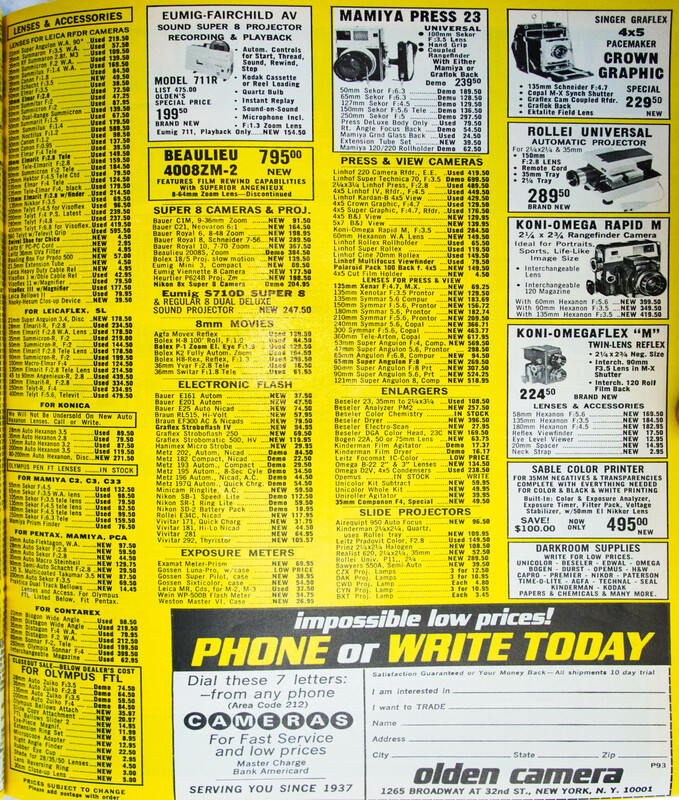 They list a used one for $184.50 in September 1973, which is about right. I’m pretty sure the new one I then got also came from Olden, and I remember it as costing $360. Custom Quality Studio in Chicago did film processing and reprints at very good prices, and they actually did a decent job. I used them up through the 1980s. They eventually disappeared. 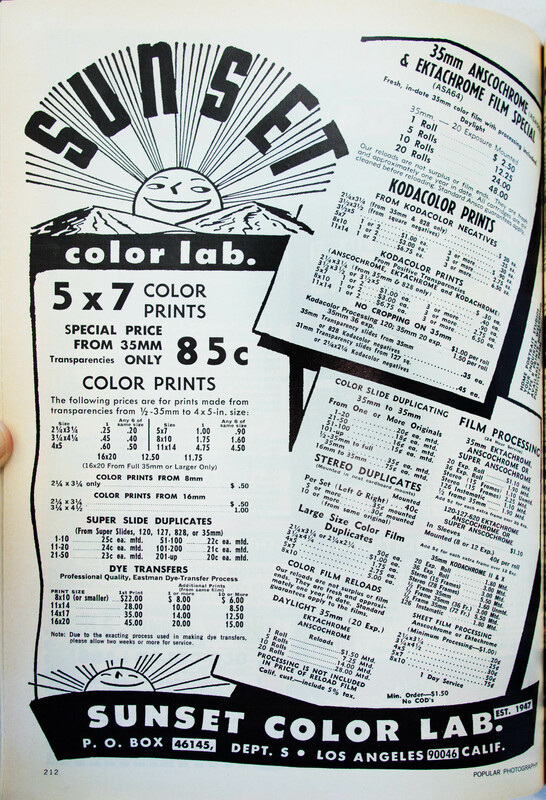 I never used Sunset Color Lab, but they had the distinction of being the only place I remember seeing that advertised dye-transfer printing services. 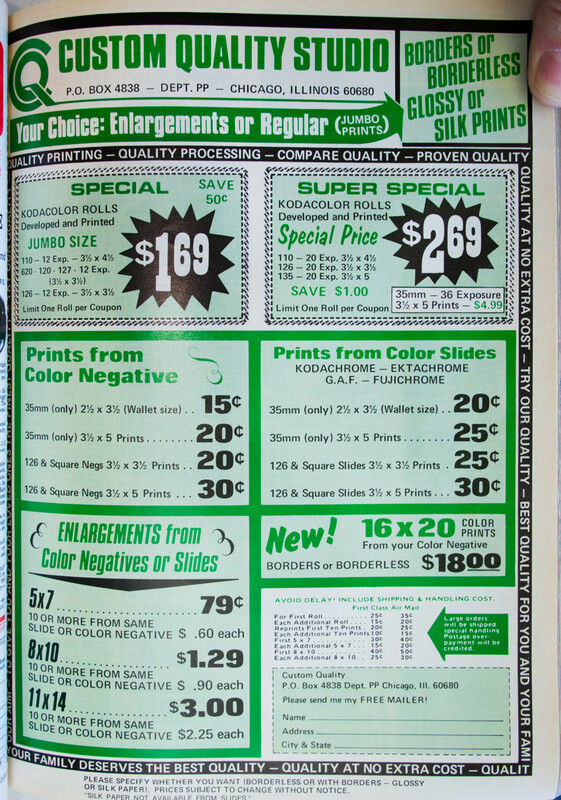 A regular 8×10 print cost $1.75, a dye-transfer print cost $22. B&H Photo is the place I most remember dealing with—but they didn’t get started until 1973, and I don’t have the first one-page ad of theirs that I found posted yet. Wall Street Camera Exchange had the weird advertising model of giving prices for unlikely trade-up exercises, and often not giving any price for just buying the stuff. I guess this let them print smaller numbers, but anybody with any functioning brain cells figured it out in the first few seconds, so I don’t know what it gained them. Is it a bad sign when I find I’m nostalgic about old advertisements?